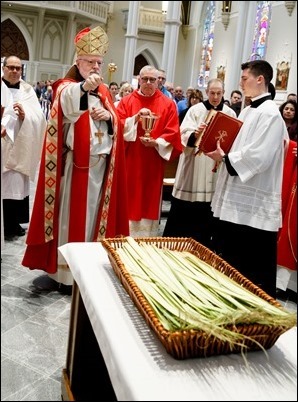 As I do each year for Holy Week, I am posting my blog a bit earlier than usual to leave myself free to participate in the events and liturgies of the Paschal Triduum. 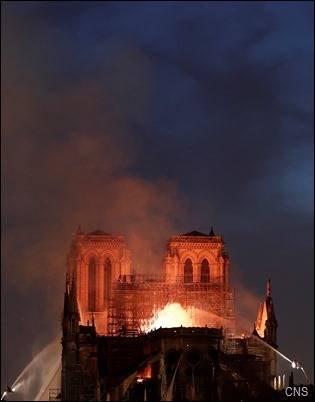 I want to begin this week by noting, even as we were celebrating the dedication of our newly renovated Cathedral of the Holy Cross, how saddened we were to learn about the devastating fire at the Cathedral of Notre Dame of Paris, one of the most important churches of Christendom. 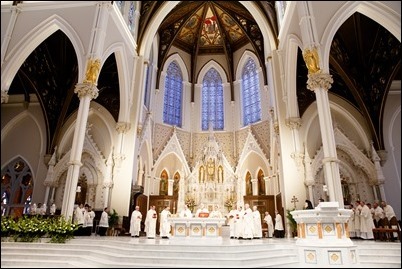 I have visited Notre Dame on a number of occasions. 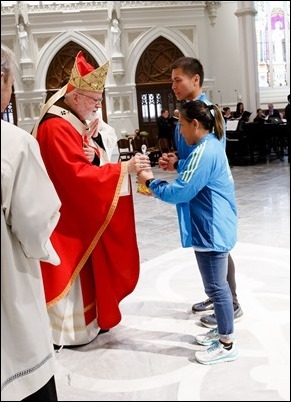 One of the most memorable was the beatification of Frederic Ozanam, the founder of the St. Vincent de Paul Society by Pope St. John Paul II during World Youth Day in 1997. 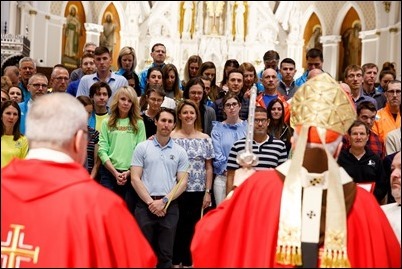 At that time, I was accompanied by a delegation from the Society of St. Vincent de Paul and young people from Massachusetts. 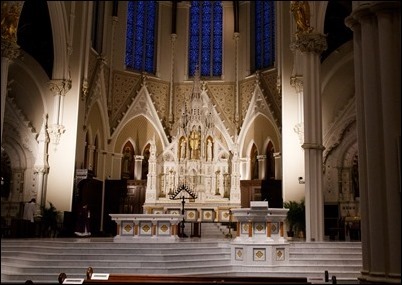 There have been churches on that spot since about the year 400, and the present Cathedral was dedicated by Pope Alexander III in the Middle Ages. 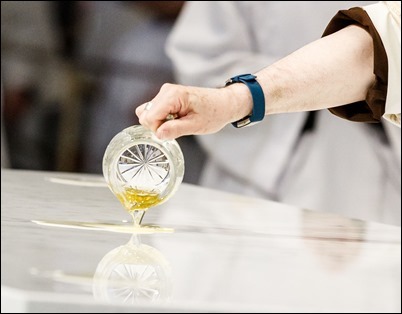 It has been said that, on the beams of the ceiling, you could see the names of the workers who carved their names there 800 years ago. 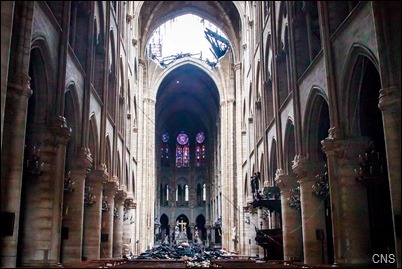 When one thinks of how many wars, revolutions and catastrophes that cathedral has survived, to see it now suffer such a terrible tragedy is just devastating. 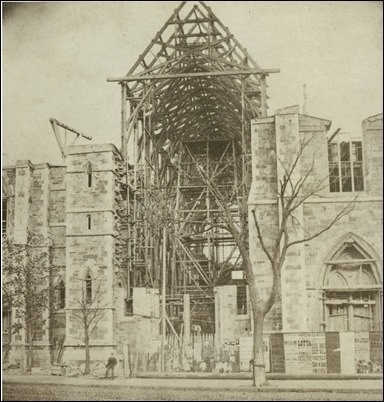 However, we were glad to learn that the towers and the walls of the nave seem to have been spared and we look forward to the reconstruction of this Cathedral, which is one of the most visited buildings in the world. 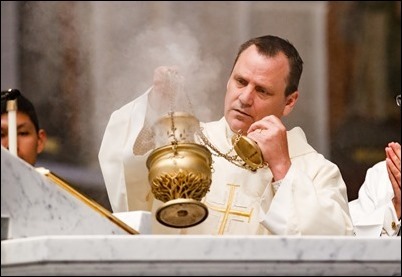 I was also very touched to hear the story of the priest fire chaplain who courageously went into the burning cathedral to rescue the Blessed Sacrament and the Crown of Thorns. 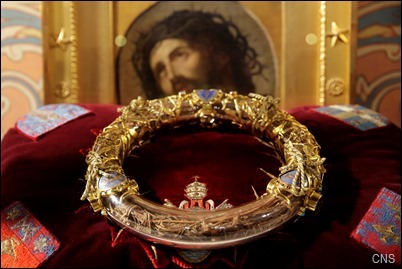 In fact, I was once able to be present for the veneration of the Crown of Thorns at Notre Dame. 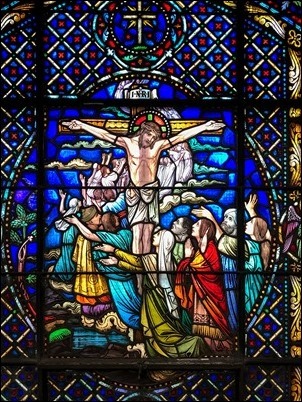 St. Louis IX brought the Crown along with other relics from the Holy Land and built the Sainte-Chapelle to house them. 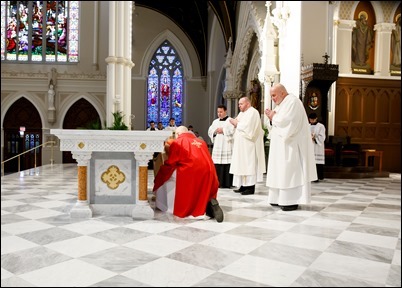 However, after the French Revolution, the crown was moved into the cathedral itself. 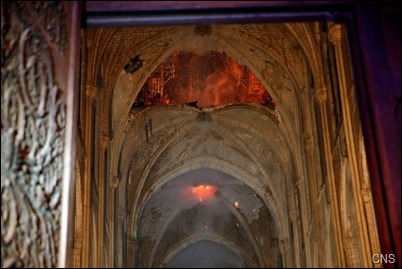 We pray that the people of France will be able to restore that very important sacred site. 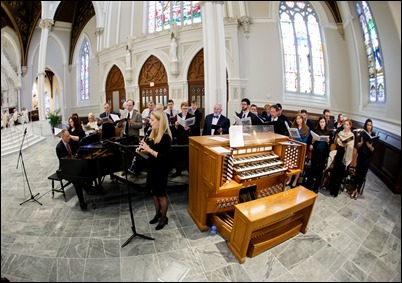 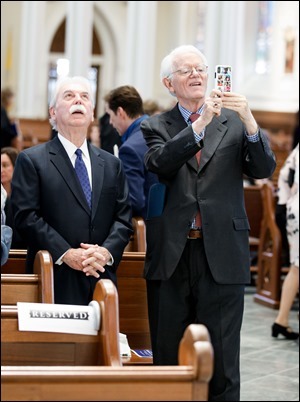 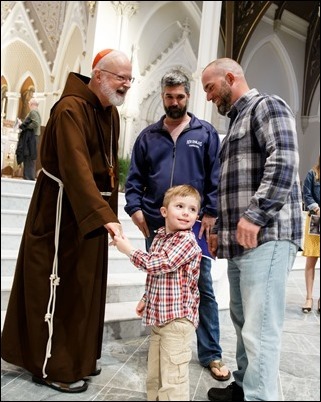 As I mentioned, this weekend we had the joy of celebrating the reopening of the Cathedral of the Holy Cross after two years of extensive renovation. 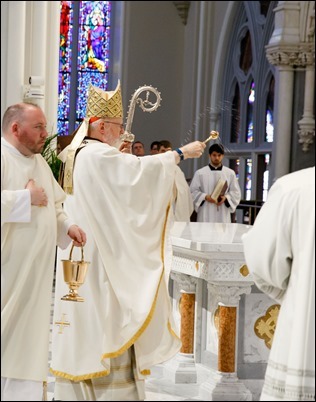 Saturday, we celebrated a special Mass for the Dedication of the Altar, to which we invited the workers, benefactors, public officials and others who had been involved in the restoration. 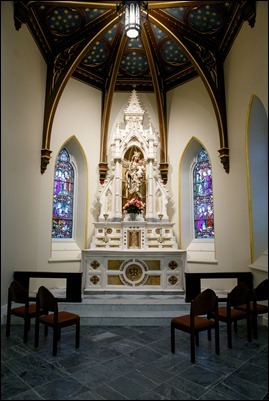 The Marian Chapel of the cathedral was previously somewhat obscured because of the lift and other things that were in the way, but now it is opened up, and it is such an extraordinarily beautiful space for prayer. 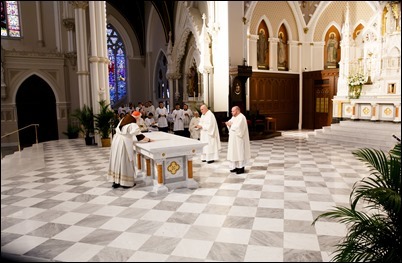 On the altar are some of the hundred roses that someone sent us to place there. 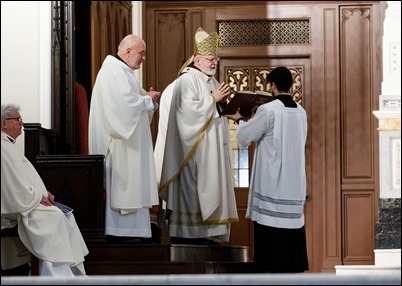 The first reading of the Mass was taken from the Book of Maccabees and told of the rededication of the altar in the Second Temple. 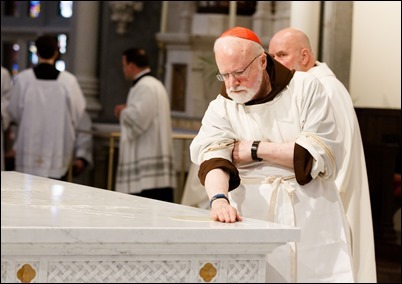 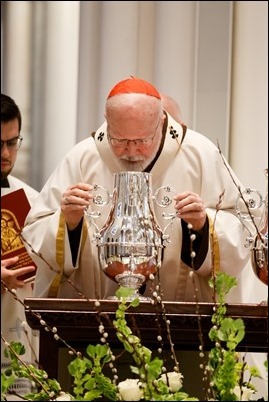 As I said in my homily, that was, in fact, what we were doing that day — we were dedicating the altar of the Second Temple — the second Holy Cross Cathedral. 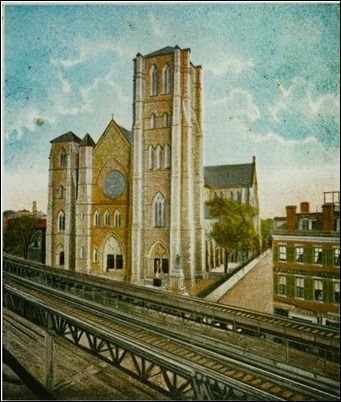 Holy Cross Church was built on Franklin Street, near today’s Downtown Crossing, over 200 years ago by Father Cheverus and Father Matignon. 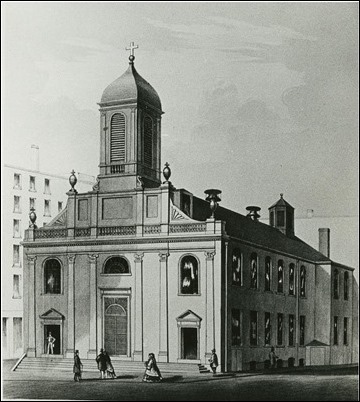 With help from the local Protestant community, they raised about $18,000 to construct that first Catholic church in Boston. 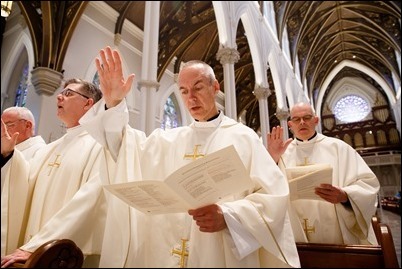 Prior to that, they had celebrated Mass in rented spaces. 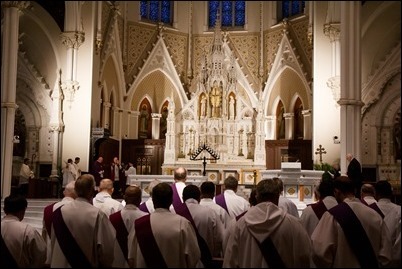 When Father Cheverus was made the first Bishop of Boston, Holy Cross Church became the first cathedral. 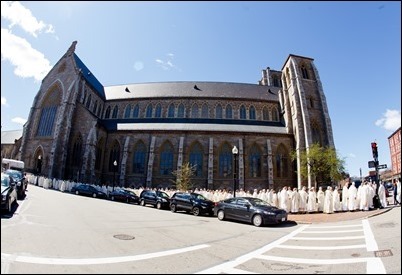 Sixty years later, particularly after the Great Famine in Ireland, so many Irish came to Boston that one-third of the population of Boston was Irish immigrants. 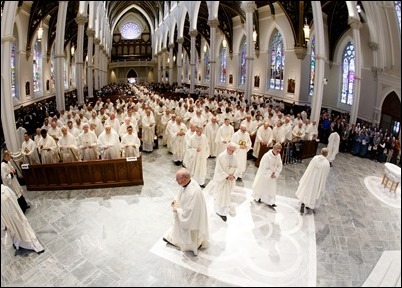 So, Archbishop Williams decided they needed a larger cathedral. 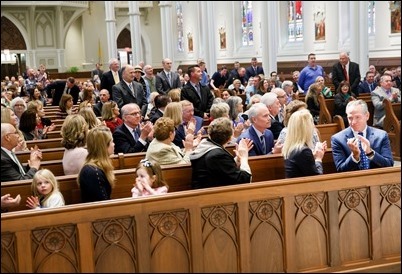 He was able to raise $1.5 million, which at that time was just an incredible sum of money, and there were over 30,000 people present for the laying of the cornerstone. 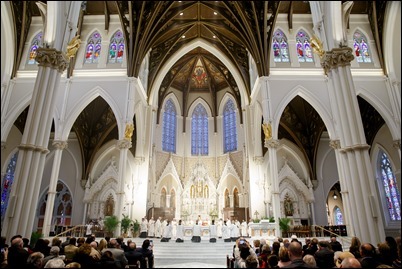 The church was built to be the largest cathedral in the United States — almost the same size as Notre Dame in Paris, St. Sophia in Constantinople or St. John Lateran in Rome. 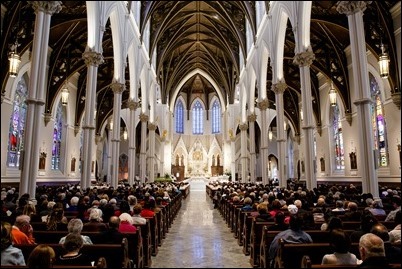 In Europe and Latin America, the cathedrals were always the center of civilization, culture, education and religious life but also the civic life of people. 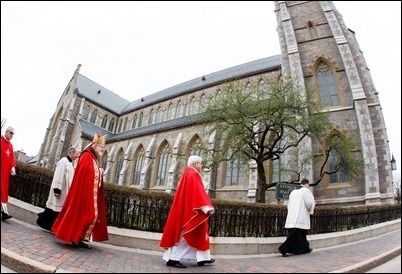 Our own Cathedral of the Holy Cross has been such an important part of the life of the church in the United States and our history here in Boston. 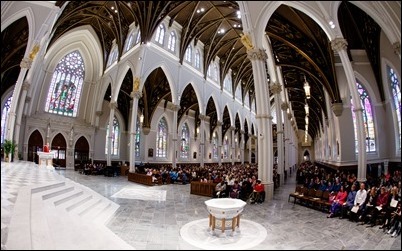 The cathedral, with its schools, has provided education for thousands of children. 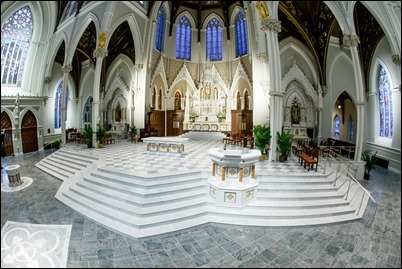 The first school was in the lower church and, eventually, Cathedral Grammar School and Cathedral High School were built. 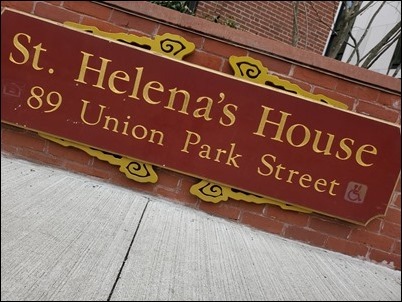 The cathedral has always done so much in the way of housing, with the Rollins Square housing development and St. Helena’s House and the Ave Maria House, which provide shelter for the homeless and low income families. 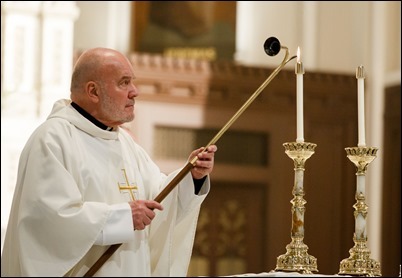 Our Cathedral Cares program helps meet the medical needs of the poor, and our food pantry supplies food for the needy. 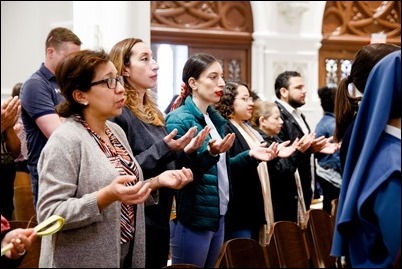 It has always been an immigrant parish, and today we have immigrants from Latin America, Africa and Asia. 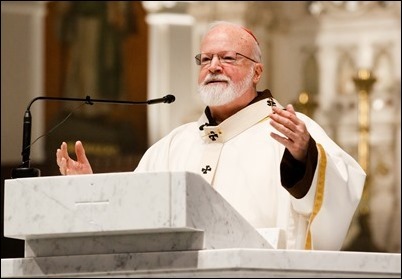 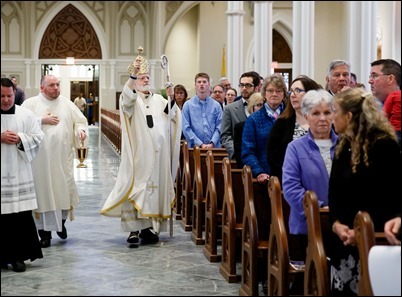 For all of us, it was a great moment of joy to be able to rededicate this cathedral, which has been so important in the history of the Catholic Church in New England. 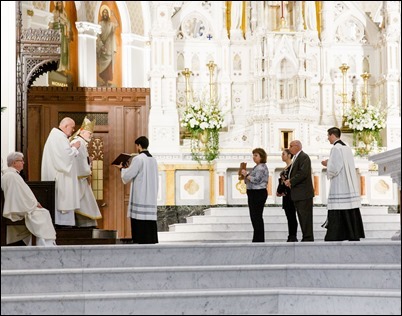 The refurbished church, with all of its beauty, is a great sign of hope to the Catholics of the archdiocese. 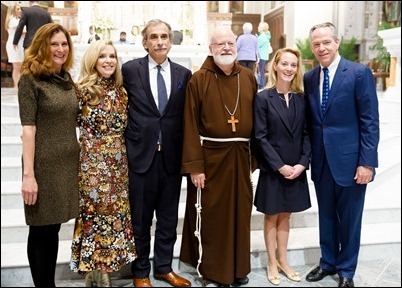 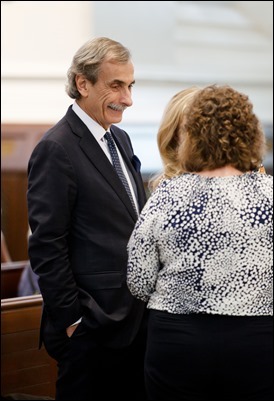 We were very happy to be joined at the Mass by David Manfredi from the architectural firm of Elkus/Manfredi and John Fish of Suffolk Construction, who oversaw the work. 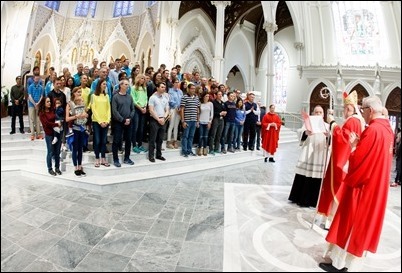 I was also very happy to see that so many of the workers on the project came to the Mass. 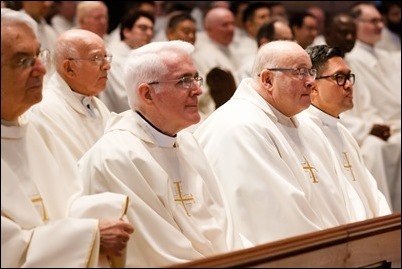 During the Mass, we asked them to stand to receive a round of applause. 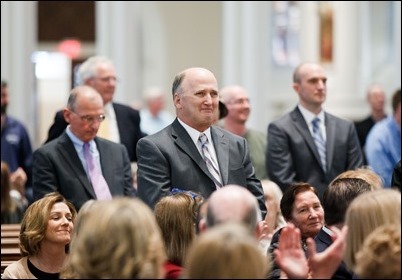 We are also very grateful to Father Kevin O’Leary for all of his work, and to all those who have been involved in the Capital Campaign. 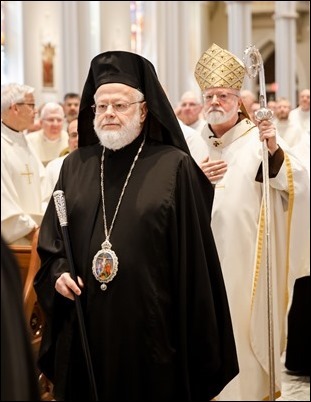 It has been the Capital Campaign that has given us the courage to be able to embark on such an ambitious project as the renovation of the cathedral. 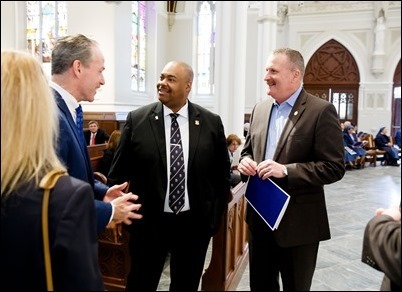 We are grateful to all those involved in that effort, particularly the pastors and parishioners who are carrying on the work in their parishes to support the Capital Campaign. 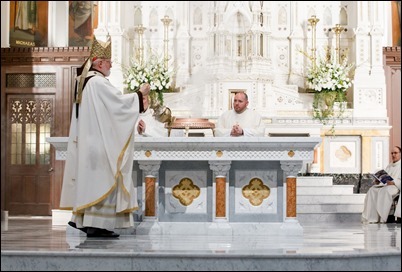 Later that day, I also had a wedding at the Seaport Shrine. 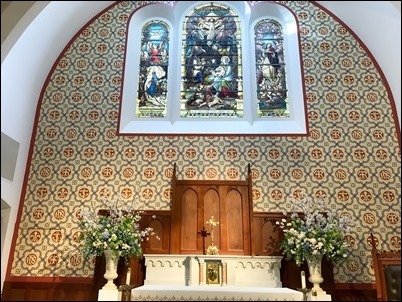 It was the first time that I had seen the new stenciling on the walls, and so I want to share this photo of that with you. 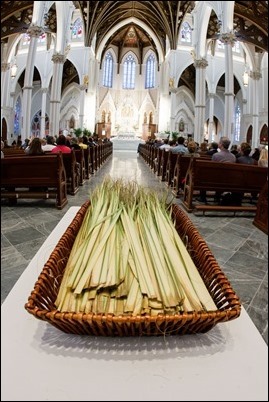 Sunday was, of course, Palm Sunday and it was the first time that most of our cathedral parishioners were coming to see the renovations. 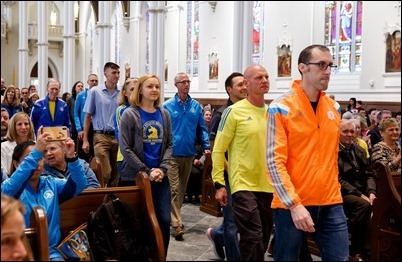 Because Palm Sunday also coincided with Patriots’ Day Weekend this year, at the conclusion of Mass we had our traditional Blessing of the Runners for those participating in the Boston Marathon. 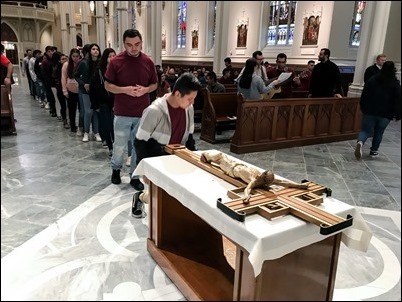 Sunday afternoon, Father Alejandro Lopez-Cardinale, Father Carlos Suarez and Father Michael Nolan came with youth groups from several Hispanic communities to visit the cathedral and to venerate the relic of the Holy Cross. 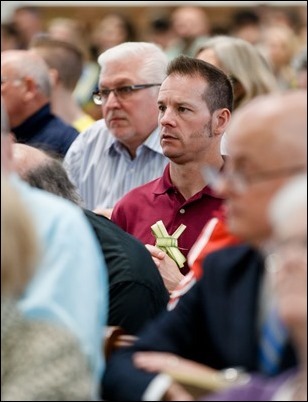 We prayed together and sang hymns, and I also gave each of the groups of a brief talk. 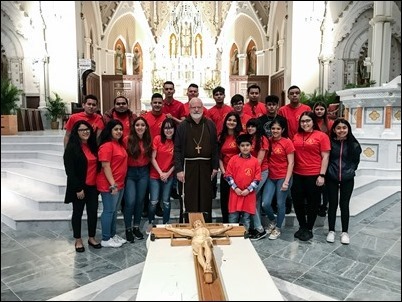 This visit of Hispanic youth groups on Palm Sunday has become something of a tradition in recent years, so we are very happy to be able to once again welcome them at the cathedral. 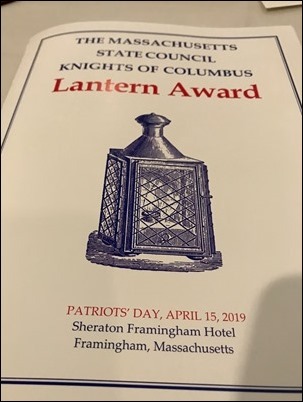 Monday was, of course, Patriots’ Day, the day that the Massachusetts State Council Knights of Columbus holds their annual Lantern Award Dinner. 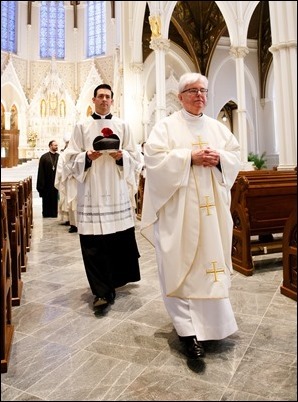 We are very pleased that one of our diocesan priests, Father Matt Wescott, who is a Marine chaplain and has been a Knight since his college days, was this year’s Lantern Award recipient. 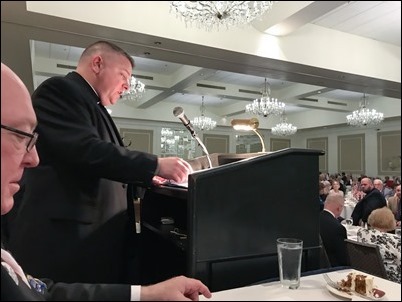 There was a great crowd for the dinner, including all the bishops of the state, with the exception of Bishop Rozanski, who was having his Chrism Mass that day. 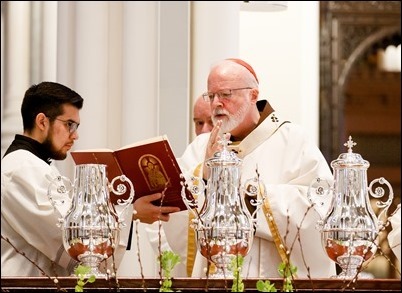 Of course, the State Chaplain for the Knights is Bishop Robert Hennessey, and they always have a birthday cake for him because his birthday falls on or near Patriots’ Day each year. 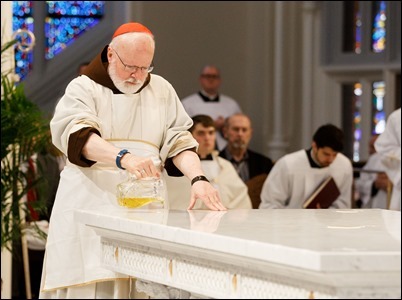 Tuesday, we celebrated our annual Chrism Mass at the cathedral. 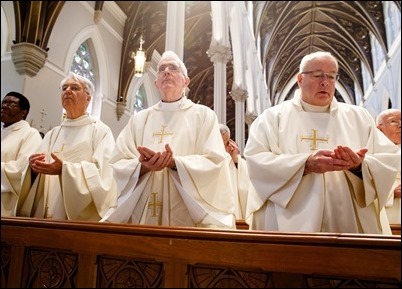 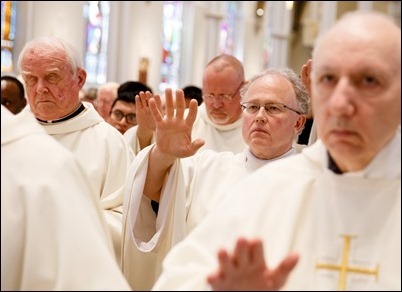 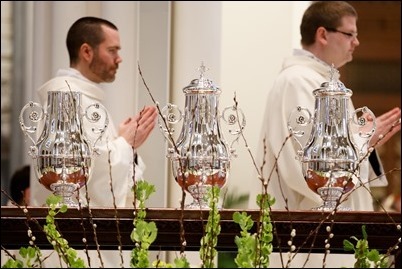 Since, in addition to the blessing of the Holy Oils, the Chrism Mass is an occasion for us to celebrate priestly fraternity and renew our priestly vows, we always have a large number of priests join us for the Mass. 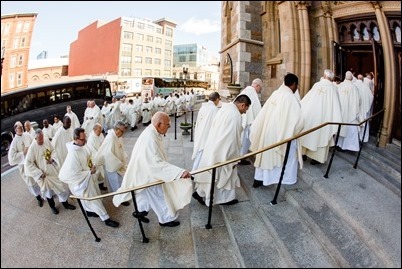 This year there was an even larger number than usual. 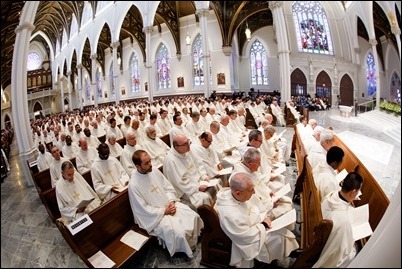 I have heard estimates that there were as many as 500 priests with us. 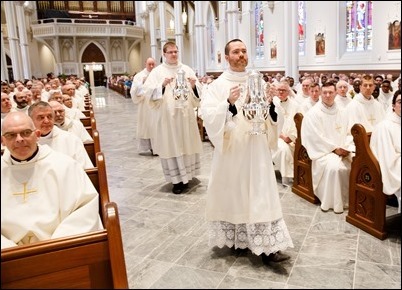 Once again, this was an opportunity for many of the priests to see the cathedral for the first time. 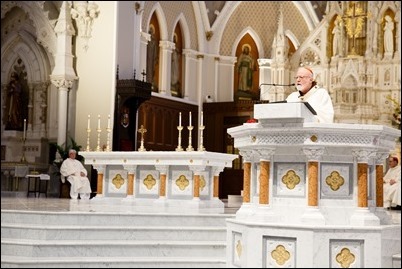 At the end of the Mass, I thanked Father Kevin O’Leary and announced that the Holy Father had made him a monsignor. 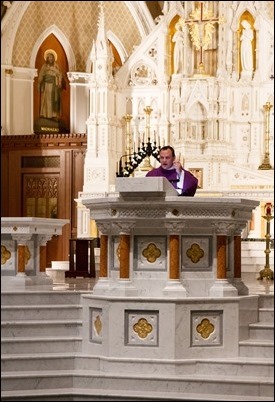 I said that, besides his talent for fixing broken down buildings, he is an extraordinary pastor. 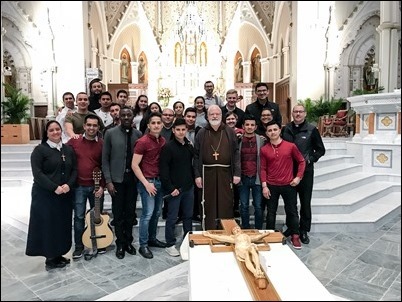 He is a man who, uncomplainingly, will go to visit the sick in the middle of the night, minister to the homeless and attend his parishioners’ pastoral needs, no matter what country they are from or what language they speak. 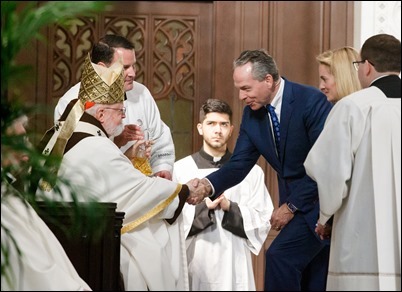 I also mentioned his great devotion and care for our religious women and said what a joy it is to live with him, because he is so considerate and thoughtful. 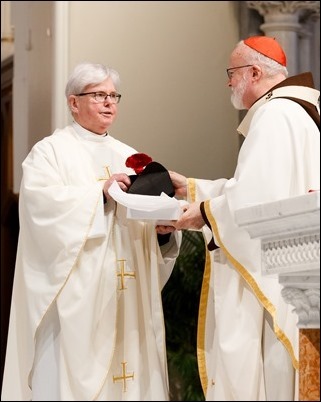 I know the priests are very happy that he was named a monsignor because they recognize the great service that he has given to the whole archdiocese. 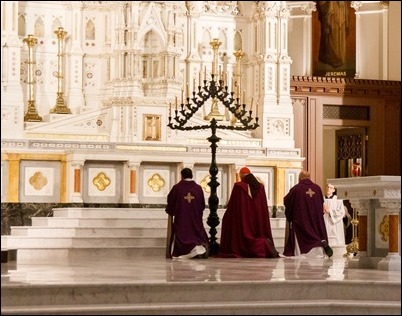 Wednesday evening, we had our Holy Week service of Tenebrae. 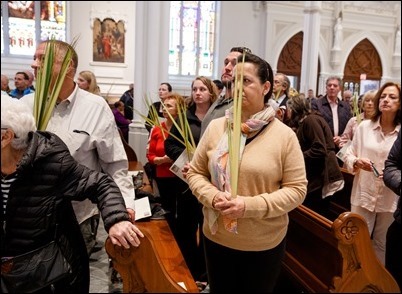 The liturgical books call for the public recitation of the Divine Office during Holy Week, and so we take advantage of that by having a Tenebrae service. 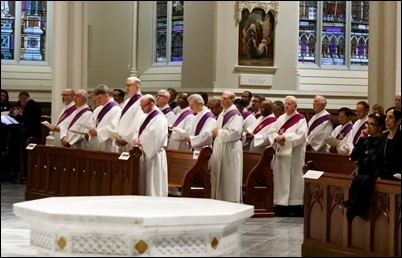 This year, I invited the permanent deacons of the archdiocese to come to renew their vows, just as the priests do at the Chrism Mass. 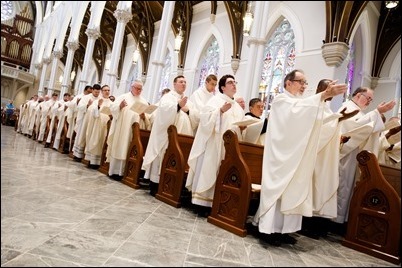 I invited Deacon Chris Connelly to give the homily, after which I led the deacons in renewing their ordination promises. 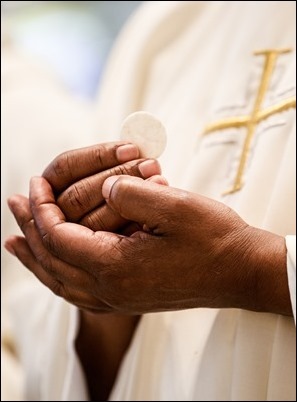 Finally, tonight we begin the Easter Triduum. 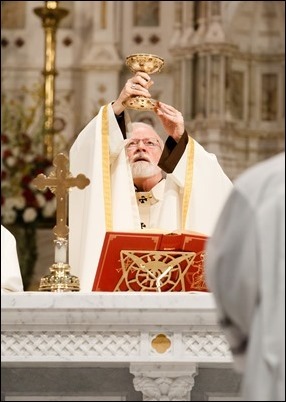 We invite everyone to participate in the liturgical celebrations, which put us in touch with the central mysteries of our faith — the great gift of the Eucharist, and the passion, death and Resurrection of our Lord Jesus Christ. 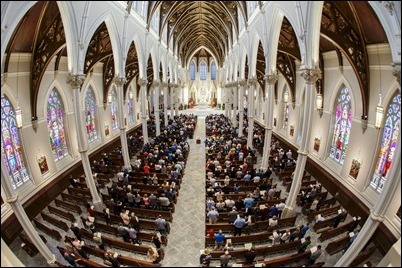 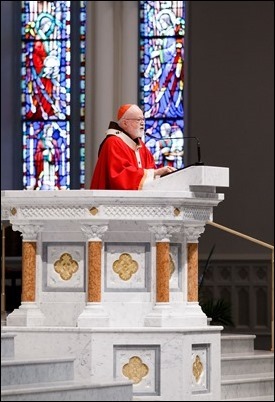 We look forward to celebrating the Triduum in the newly renovated Cathedral and pray that, just as the cathedral has been renewed and beautified, this will be an invitation for all of us to renew our own commitment to our baptismal vows and deepen our own conversion to a life of discipleship.